So far it reminds me a bit of a smaller Opel Insignia (Buick Regal). Weird roofline that doesn't appear to improve either rear headroom or cargo capacity. What's the point? It better be much bigger than the last one. Also, it MUST seat 5. 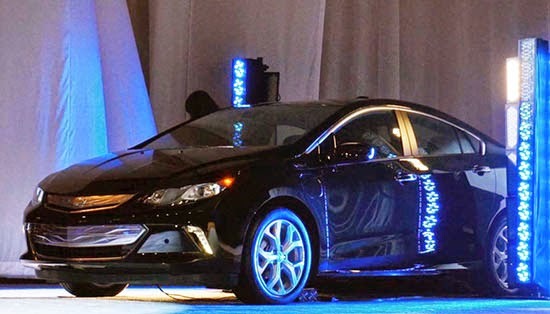 Charging almost twice the price of a Chevy Cruze and seating only 4 is a joke. This one angle/ view shows front beak that reminds of ILX a bit... and yet there's a try at Chevy family resemblance with body-colored bar dividing grille. That's exactly what I thought, Honda Civic! If a Honda Civic mated with a Dodge Dart. The roofline is eye-catching. Naturally GM's designers choose to ignore it when designing the front end. Instead, they gave us something angular, awkward, way too shiny, and reminiscent of both the Honda Civic and the final, horrible years of the Chevy Cavalier. I can't imagine this appealing to anyone other than teen girls. And I can't wait to see what they've done to the Camaro. Jeez, guys. You can only see part of the car. Your criticisms are a bit premature (don't you think?) Wait until you get to see the whole thing before you start with the barbs. Sloping roofline as some pointed out maybe a big problem for back seat passengers. Front end does resemble ILX. Okay, I'm not sure what to think at the moment except wait until the big reveal in Detroit. I see Saturn Ion, curernt Civic, and other baked in designs so maybe the goal was to make it appear less hybrid, and blend in more as a regular sedan...If so they have succeeded.